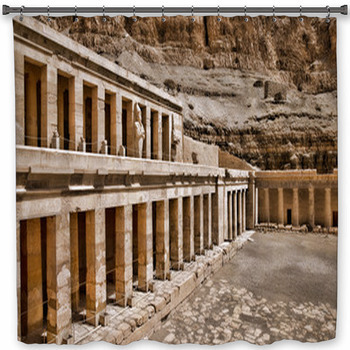 Bring history, beauty, and staggering scenery to your decor with custom Egyptian bath decor. 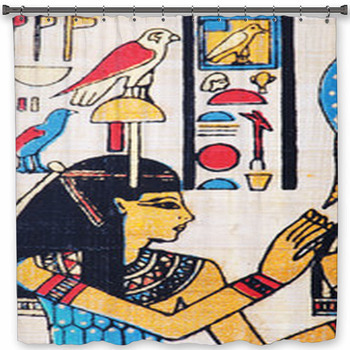 Hang the feathered arms of a pharaohs attendant across your shower, with pastel teals and soft golden browns. 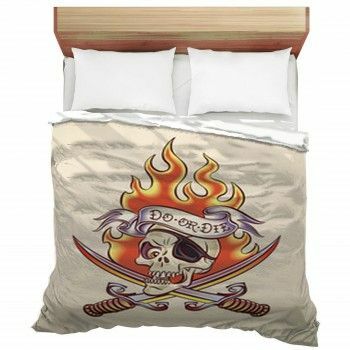 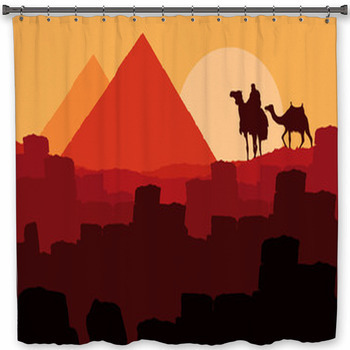 Join a convoy of camels blackened by the deserts scorching heat on apricot sands swirled with mocha shadows, pyramids of chocolate and milky mocha leading them home at the end of the day to the wall of your shower. 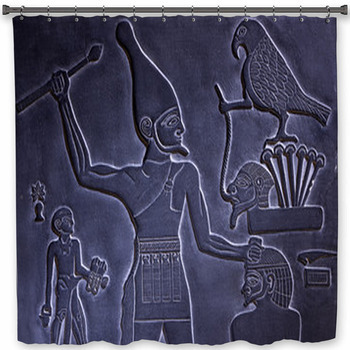 Welcome an ancient Egyptian queen into your home with her blue headdress and long bronzed neck. 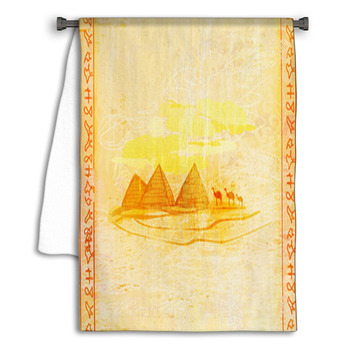 Hang a gleaming white sun like an eye of Providence in turquoise skies over nutmeg pyramids and golden sands on a custom Egyptian themed shower curtain. 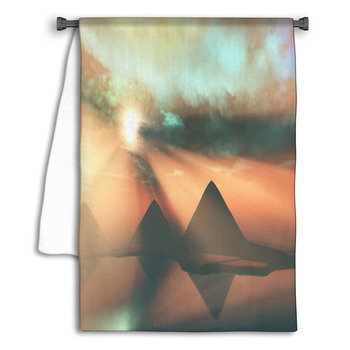 Float a painted Egyptian barge with pink lotuses on a green river under charcoal skies. 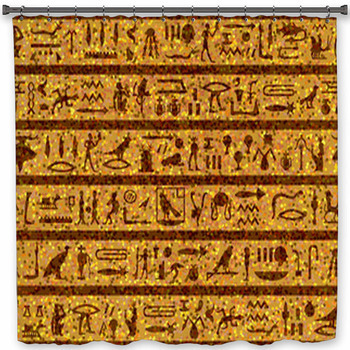 Leave the shine of Egyptian hieroglyphics in carved bars of glistening gold in your bathroom. 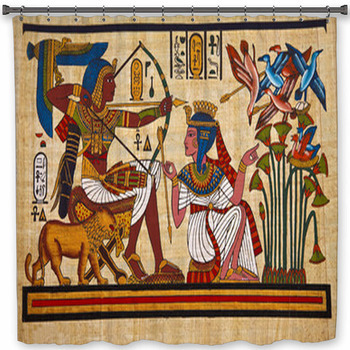 Bring the lotuses and papyri of Egyptian mythology to your decor in a patterned bath mat of browns and greens, or the hunting spears and snake squiggles, the black jaguars and puffed cobras, of tomb art in black and white. 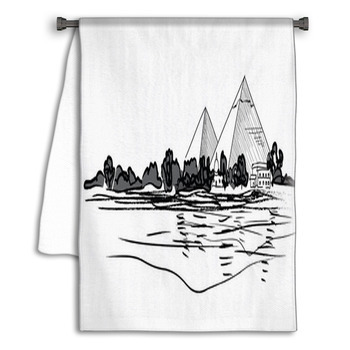 Leave camels in a Bedouin oasis of cool watery blues, with rounded hills and swirling palm trees on custom size Egyptian themed bath towels. 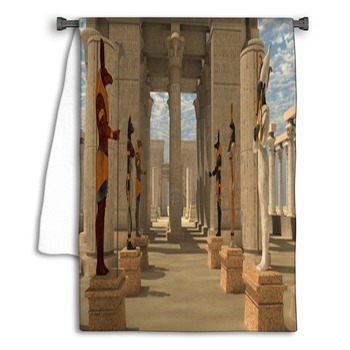 Take your Egyptian fascination with you even in the bathroom. 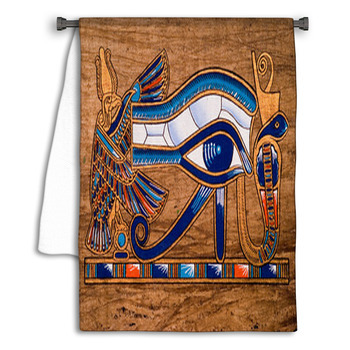 It's like stepping in and out of Egypt whenever you want.